Just found this forum and hopefully will be very useful to me. I have been playing around with GIMP but its I find it too complicated and need to start from the beginning with the right tutorials. I'm looking to design a logo and need to make the icon transparent or negative space. Would appreciate if someone can show how this can be done. Also, any beginner tutorial videos to get me started. I'm looking at studying branding and logo design. With a logo like that it is easy to remove background leaving just the white shape in transparent image. Colors -> Color-to-Alpha and color pick the background. example: https://i.imgur.com/sogPmgI.jpg OK then Export the image as a png to preserve the transparency. Gimp tutorials for beginners? Avoid most of them like the plague, including anything with 'davies' in the title. Very often give incorrect/bad advice. Many are for Gimp 2.8 and earlier and things change. Rich2005, as a newbie myself, I've recently watched a long string of YouTube tutorials on various aspects of GIMP. I try to find ones that specifically use 2.10, but will watch an occasional 2.8 one, realizing that things do change, as for example, certain Alpha channel features available in 2.8 and not 2.10. I don't recall watching any by Davies, and I don't recall any with bad advice, though I don't doubt some are there. While I respect your opinion and appreciate your warning, I don't think I could have gotten half as far as I have in a relatively short time without YouTube videos! Maybe part of the secret is to work along with the video. If something seems wrong or doesn't work for you, check it out on the forum. BTW, I echo Rich205's thoughts on using Inkscape for that logo. Yes, that's another learning curve, but one worth climbing. My dream app would be a gargantuan piece of software that combines both programs in one. They complement each other well, and I'd so love to avoid transferring saved files back and forth. I'm finding the series of Inkscape YouTube tutorials authored by Logos by Nick to be invaluable and spot on for accuracy. 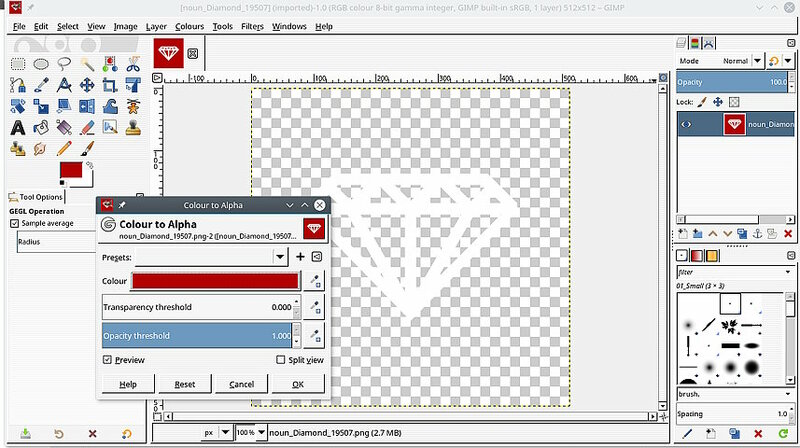 Post a few Gimp links that you consider especially useful. While for Inkscape, I think there is a list of tutorials on the forum but generally ask on their forum and someone will reference the documentation. I was actually looking for the icon to be cut out, transparent and I may have figured it out. (02-06-2019, 04:32 PM)Zon Wrote: I was actually looking for the icon to be cut out, transparent and I may have figured it out. Yeah, color-to-alpha (aka c2a) with the default white will do that. Is there a work-around for color-to-alpha in 2.10? (02-06-2019, 05:48 PM)Ritergeek Wrote: Is there a work-around for color-to-alpha in 2.10?